Place black-eyed peas into a large container and cover with several inches of cool water; let stand 8 hours to overnight. Drain and rinse. Heat olive oil in a pot over medium heat; cook and stir ham until browned, about 5 minutes. Add onion, green bell pepper, and garlic; saute until onion is tender, about 10 minutes. Add black-eyed peas, water, bay leaves, paprika, salt, and black pepper; cover pot with a lid and simmer until peas are tender, 40 to 50 minutes. 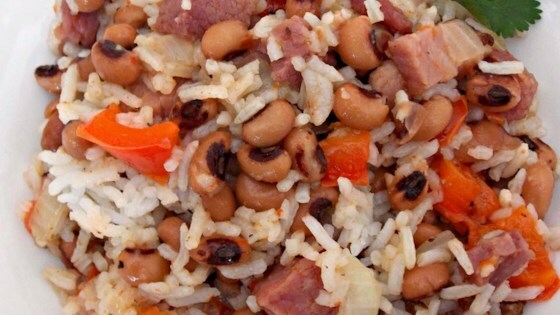 Remove bay leaves from black-eyed peas mixture and stir in rice. Simmer until all the liquid is evaporated, 5 to 10 more minutes. Enjoy them on New Year’s Day and grab a little luck for the entire year!